CPAC 2013 “The Uninvited” Panel VIDs and PICs | the "silent" majority no more! March 16, 2013. Washington, DC. CPAC (The Conservative Political Action Conference). This was the last of the 3 day conference. I hadn’t intended to cover CPAC this year after Grover Norquist and Suhail Khan, once again, censored the panels and topics more severely than they had in the past. Their control as board members of CPAC is complete: No criticism of Islam is permitted. EVER. Once the voices of TRUTH, Pamela Geller and Robert Spencer, were shut out (as were others) Brietbart News made the brave decision to host a CPAC panel of those voices: The UNINVITED. It was a superb panel comprised of Rosemary Jenks of Numbers USA, Dan Gouré of the Lexington Institute, Nina Shea of The Hudson Institute’s, Frank Gaffney of Center for Security Policy, Robert Spencer of Jihad Watch and THE Pamela Geller of Atlas Shrugs. All last minute, but I managed to be there. the room was packed. I grabbed a couple of shots as the people were streaming in. Opening remarks by Larry Olav, CEO of Breitbart News (and a childhood friend of Breitbart’s), Steve Bannon, a executive with Breitbart News, Congressman Steve King (R-Iowa) and Larry O’Connor, Editor of Breitbart TV. Robert Spencer of JihadWatch.org spoke on “Why I am Not a Conservative”. At one point, Spencer responds to Bannon assertion, “This is NOT personal”. It’s about the TRUTH. 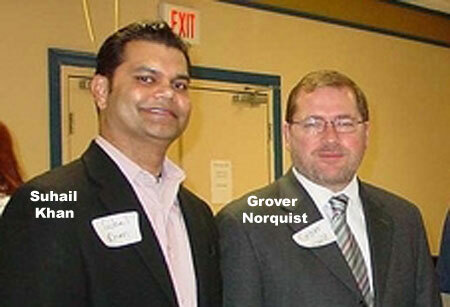 Norquist and Khan and who they are aligned with. The Muslim Brotherhood. Just like Obama. Foreign Policy and Domestic Policy. They must be exposed. It must be talked about. They made it necessary to create this “Uninvited” Panel. “Death of Free Speech” was the topic of Pamela Geller of AtlasShrugs.com . As she shared her very public battle to post her ads exposing Sharia and Jihad. In the these excerpts from the Q and A, we hear responses from Pamela Geller, Robert Spencer, Steve Bannon and others. Orly Taitz was in the audience and had a complicated exchange with moderator Steve Bannon. An, also, Nina Shea of the Hudson Institute who spoke on the Persecution of Christians in the Muslim Middle East. Geller has more on the panel posted here>>. Some electronic ‘rifle’ target practice at the NRA Table. And as I left the Exhibit Hall, I noticed that traitorous JERK , Adam Kokesh. He has, of late, masqueraded…. for the gullible…. as a Republican, a Libertarian and NOW a news reporter. His wiki link is annoying, as it leads off with the ridiculous claim that he’s a Republican. Adam and his comrades were there….checking us out…. And for the curious, more on who “Adam-the Man” really is. His disgusting “Dancing at Jefferson Memorial” . Curiously, on the table in the back ground, is a box that says ‘Al Jazeer Public TV”. Wonder what that table was about…. BTW- as I entered the Gaylord Convention Center/Hotel , and was lead to where I was to pick up my press-pass, I saw THIS t-shirt on a woman ( that could have been a Laurie Arbeiter clone. 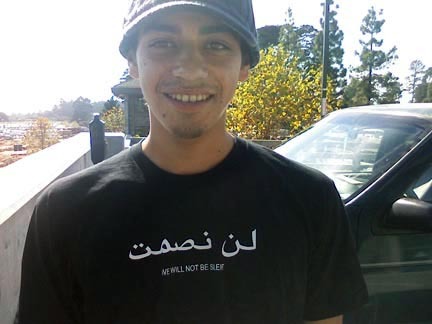 The Arabic below says “We will not be Silent”. Arbeiter, is an antiwar activist with a group called the Critical Voice,). Wish I’d had my camera out and ready to grab a picture of that shirt passing by. Wonder what part of CPAC they were covering …. Pingback: CPAC 2014 (three days full) vids & pics | the "silent" majority no more!